Where does the energy we need, animals need, and plants need come from? Largely, it just comes from the sun. Plants use solar energy to grow and develop, and animals and humans then get that energy from plants. It’s an amazing thing that we generally don’t give much thought to. Interestingly, a similar thing we don’t give much attention to is that the fuel we use to create electricity and to power our vehicles also essentially comes from the same source. Fossilized remains of plants and animals are burnt in order to create our electricity and move our cars and planes forward. Does all this get you thinking? It certainly got me thinking…. Unfortunately for Mr. Edison, we have probably waited quite a bit too long. But at least we are getting to it now! Beyond general reflection, check out this fascinating chart below regarding the potential of solar energy compared to other commons sources of energy. But before doing so, pay attention to this very important note: solar energy potential and energy potential shown for the other renewable energy resources is annual potential, while the energy potential shown for the fossil fuel resources is total recoverable reserves. Yep, solar energy really is the motherload. So, the question is, what have we been waiting for? Well, we had to develop a technology that could efficiently and cost-effectively capture that solar energy and turn it into electricity. Luckily, we’ve now been able to develop such technology, and solar panels are so ridiculously cheap now (after years of rapid cost drops) that the average American who goes solar now saves over $20,000 over 20 years from doing so. Perhaps it’s time to do the obvious and put your money on solar energy… just as Thomas Edison would have done if he were alive today. At the very least, get a quote in order to see how much you could save by going solar today. Thank you for posting this! 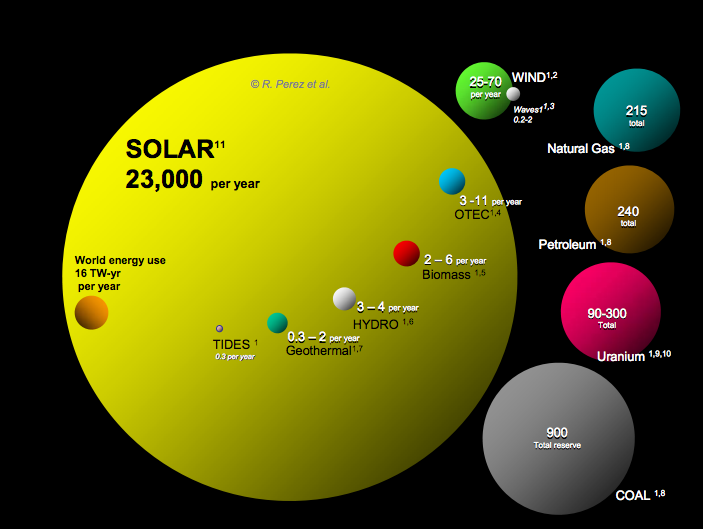 The graphic truly puts the potential of solar into perspective. With the current rebates and tax incentives, the biggest obstacle that the solar community faces is not cost, but the lack of awareness and knowledge on the subject. Many companies are offering a very affordable leasing package that allows homeowners to install solar panels for as little as $0. Upon hearing this, one would assume that there must be some sort of catch. But there is no catch! There needs to be a commitment from the solar industry to educate homeowners and to spread awareness of how affordable a solar system can be. I’ll definitely be sharing this post! Home owners need to be aware of practices being used to curb their ability to enjoy solar power and at the same time reap any rewards from putting any excess back into the power grid..Look at California which limits the amount of panels your allowed to use, thus, preventing in a small way the return to you to cover the cost of installing panels on your house (or the number of panels you can put up that potentially keeps you from making a profit with larger solar arrays that put power back into the grid).